Santa's Sleigh is loaded with toys and treats for all the good little girls and boys. Make sure your little ones are on Santa's "Nice List" this year! 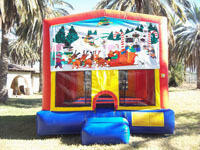 Book this Christmas Themed Bouncer for your Holiday Event.